Browse: Home /	CSO (Combined Sewer Overflow), Permaculture, Recycling, URBAN FARM & GARDEN / Thanks to All Who Attended Event #3! 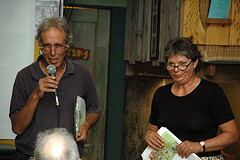 We had a full house for Friday’s lecture by Wilton Duckworth and Joan Ewing of Green Phoenix Permaculture. Wilton provided some fascinating historical perspective on New York City’s infrastructure; I was particularly intrigued to learn of our transition from a city that was once able to sell its “night soil” (waste from outhouses) to farmers on Long Island for fertilizer, to our current garbage situation requiring massive daily truck caravans to cart our waste to faraway locations, at huge municipal expense. Joan also spoke eloquently of the city’s human resources â€“ energy of youth, wisdom of elders, richness of cultural diversity, etc. â€“ and the need to reclaim our time so we can better utilize them. Harvesting rainwater to mitigate Combined Sewer Overflow and promoting community composting to turn organic waste into nourishment for the city’s gardens and parks were just two of the ideas discussed on what Urban Permaculture might look like; both exemplify perfectly the Permaculture philosophy of turning problems into solutions. It is worth noting that these activities make sense financially as well as environmentally (homeowners, checked your water bill lately?) and are relatively simple to implement. Sustainable Flatbush would like to give big big thanks to Joan and Wilton for coming back to the neighborhood to share their knowledge and experience with us!! more photos from Event #3 can be seen at Flatbush Gardener’s Flickr gallery. I was definitely taken by Joan’s and Wilton’s reference to our “human” resources: our neighbors, our young, our old. It took me a couple of days to really understand what they meant and how that translates into “urban” permaculture. It’s not simply about gardening at all! We’ve forgotten how important it is to care and to be with and to relate to and meet and organize with our neighbors. As they so beautifully synthesized, permaculture does more than sustain, it restores! and what better to restore than our human spirits our social networks our COMMUNITY! beautiful! and thank you so much Anne for organizing such an enlightening event!